As someone who has been familiar with Southeast Michigan for some time, yet still largely ignorant about Detroit-specific history and culture outside of the headlining events and milestones described in books I have read about the city, oral histories have become a sought-after contextual tool in my Detroit experience. Be it a tour led by Detroit Experience Factory, podcasts like Daily Detroit, the Detroit Local or the DBrief, or simply seeking out stories from my coworkers and peers in the Challenge Detroit ecosystem who know more about the city than I do, hearing hyper-local intrigue and obscure records from unofficial sources has become a treasured practice for me. Two events I recently attended within the city that gave me the same fascinating mix of history and comedy I have recently found myself seeking, and, as a pleasant surprise, a sense of Detroit as my home. ‘The Detroit Musical,’ which I saw at Planet Ant in Hamtramck on March 14th, 2019, focused on the La Merde family. A fictional bloodline that has been in the city of Detroit since Cadillac landed at the shores of the modern day Detroit River, the La Merde’s are portrayed with lineage of misfortune, and somehow always find one of their own at the most famous events in Detroit’s history. Like many of the shows that grace the stage of Planet Ant, ‘The Detroit Musical’ was a largely explicit affair and a transcription of its songs may not be best suited for this blog. But the play artists’ ‘reenactment’ of La Merde (circa 1920s) and his insistence on Henry Ford’s insanity for ditching the steam engine; their interpretation of the Lafayette vs. American coney dog rivalry, which includes a refrain comparing coney sauce to similarly colored bodily substances; and a song about everyone’s favorite suburb, Livonia, made nerve-rackingly hilarious in its leading rhyme structures that places exceedingly vulgar lyrics in the minds of audience members without ever saying them out loud. ‘The Detroit Musical’ felt like a 2-hour long inside joke about our favorite city, and every second was a blast. Another event that made me feel at home in a way I hadn’t before was the annual Marche Du Nain Rouge. A bizarre tradition which marches black and red-clad Detroiters from 2nd and Canfield to Cass Park, the Marche Du Nain Rouge is at once a celebration of the end of winter, a chance to have a drink during the day on a Sunday, and a casting-out of Detroit’s resident demon, the Nain Rouge, a legendary character rumored to have been set as a curse upon Cadillac as he arrived in Southeast Michigan. The parade was lead by the Nain Rouge’s float, where a pre-recorded tape blasted the demon’s jabs at Detroiters, saying things like “I bought tickets to Hamilton and I’m only scalping them North of 8 Mile,” “What about another co-working space?” and “All you Detroiters really need is another Whole Foods, or maybe one in every neighborhood!” Despite the boos parade-goers answered these insults with, just as often one could hear laughs from the crowd, a collective acknowledgement of the problems the people of Detroit have weathered and continue to deal with. When we made it all the way down 2nd Avenue and landed in Cass Park, breaking with the tradition of casting the demon out of the city, the Nain was invited to the after party at Masonic Temple, forgiven in part for the grief he has caused Detroit over the years. 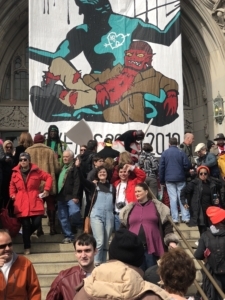 Regardless of the more merciful treatment of Detroit’s resident demon this year, the event’s catharsis came, for me, during each and every bellowing ‘BOO!’ that came from the crowd to interrupt the Nain’s keynote speech on the steps of the Masonic Temple. 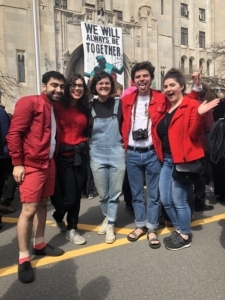 Just like ‘The Detroit Musical,’ the Marche Du Nain Rouge of 2019 was, to me, a window into what it means to live, work, play, give and lead in the City of Detroit. Laugh at our absurd history while working toward a less fraught future; draw ridiculous lines between near-identical flavors of coney sauce; wander the streets of the Cass Corridor with strangers in elaborate costume to cast out a mythical creature. Coming together to celebrate our city’s progress without ever forgetting to acknowledge all we have yet to overcome.